Just about any true coffee connoisseur will tell you that for coffee beans to develop their full flavor profile, it is absolutely necessary to grind the beans right before preparing the coffee. Therefore, in order to enjoy the "perfect" coffee time after time, it is important to be equipped with a good coffee bean grinder. There are two type of coffee bean grinders: blade grinders and burr grinders. A blade grinder has a blade in its center that looks like a propeller. Most people have seen or used one of these. A burr grinder, on the other hand, is made up of two revolving abrasive surfaces called burrs between which the coffee beans are ground. A burr grinder crushes the beans as opposed to slicing them as in the case of blade grinders. The reason that coffee aficionados prefer burr grinders over blade grinders is that you have much better control over your grind than you do with blade grinders. Perfect coffee requires not just the right size of grind for the type of coffee you like, but also uniform grinds, and that is much harder to achieve with blade grinders. This article will compare the three most popular electric conical burr coffee grinders bought by Amazon customers: Breville Smart Grinder Pro, Baratza Vırtuoso and Bodum Bistro. These three burr coffee grinders were the top sellers in their category at the time this article was written and have received excellent reviews from Amazon customers (an average of at least 4 star rating out of 5 stars for each of them!). Breville Smart Grinder Pro, Baratza Vırtuoso and Bodum Bistro. All three coffee grinders have distinct settings to enable grinding for espresso, percolator/drip filter and French press. The large number of intermediate settings allows finer adjustment of the grind. See Note 2 below for a description of how the grind settings are selected for each of the three burr grinders. This unit allows you to grind directly into a grinds container, into a drip coffee filter basket, or into a portafilter. GRIND AMOUNT/PROGRAM Button: By rotating the Grind Amount dial, you can adjust the grinding time to achieve the correct amount of coffee. Increasing time will increase the dose and decreasing the time will decrease the dose. Each adjustment will increase or decrease the grind time by 0.2 of a second. Once you have set your required dose, you can program the selected time into the number of shots currently displayed on the LCD by pressing and holding the PROGRAM button. The grinder will beep twice to confirm that the programming was successful. The programmed dose will become the default dose unless modified again. SHOTS/CUPS Button: It is used to select the desired amount of ground coffee. You just need to press the SHOTS|CUPS button until the desired amount is displayed. The amount dispensed will vary depending on the grind size and grind amount selected. Automatic Grinding: When selected, the grinder will automatically stop when the preset amount of coffee is dispensed. To select automatic grinding, you just need to press and release the START|PAUSE|CANCEL button. If you are using the portafilter, push the handle of your portafilter once. This will activate the portafilter switch. Manual Grinding: To select manual grinding, you just need to press and hold the START|PAUSE|CANCEL button. Releasing the START|PAUSE|CANCEL button will stop the grinder. If you are using the portafilter, push the handle of your portafilter to activate the portafilter switch for as long as you require. Pause Function: During grinding, pressing the START|PAUSE|CANCEL button again will pause the operation for 10 seconds. Pressing it again will resume the balance of the dose. 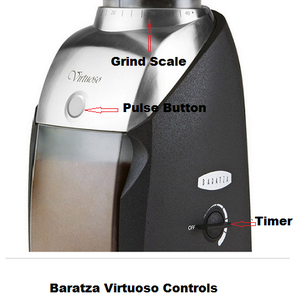 Baratza Virtuoso is equipped with a grind scale just where the bean hopper is attached to the housing (see image). You need to slowly rotate the bean hopper clockwise or counter clockwise to align the indicator on the bean hopper wit the desired setting on the grind scale. Turning the hopper counterclockwise produces a bigger particle size, and turning it clockwise produces a smaller particle size. Grinding will start when you press the pulse button, and it will stop when you depress it. Each of the 6 segments around the timer dial represents 10 seconds for a total of 60 seconds. The grinder switches off automatically once the selected time has elapsed. If you want to stop the grinder before the time has elapsed, simply turn the dial counterclockwise until the grinder switches off. Bodum Bistro is equipped with a grind scale just where the bean hopper is attached to the housing (see image). Three small symbols on the scale indicate espresso, filtered/drip coffee or French press. Intermediate dials are for finer adjustment. You need to rotate the bean hopper clockwise or counter clockwise to align the indicator on the bean hopper wit the desired setting on the grind scale. Turning the hopper counterclockwise produces a bigger particle size, and turning it clockwise produces a smaller particle size. To initiate the grinding operation you have to use the timer dial that is located right by the grind scale. The timer can be set in 5 sec intervals up to 20 seconds. Once the timer is set, to activate you have to press the start/stop button which is next to it (indicated as I/O in the picture). If you want to interrupt the grinding before the time has elapsed, simply press again the start/stop button. For Automatic Grinding: When selected, the grinder will automatically stop when the preset amount of coffee is dispensed. To select automatic grinding, you just need to press and release the START|PAUSE|CANCEL button. If you are using the portafilter, push the handle of your portafilter once. This will activate the portafilter switch. For Manual Grinding: To select manual grinding, you just need to press and hold the START|PAUSE|CANCEL button. Releasing the START|PAUSE|CANCEL button will stop the grinder. If you are using the portafilter, push the handle of your portafilter to activate the portafilter switch for as long as you require. When using the pulse button on Baratza Virtuoso, grinding will start when you press the button, and it will stop when you depress it. Grinding can also be initiated using the timer as described in Note 2 above. Bodum Bistro does not have a pulse button, but grinding is initiated by setting the timer and pressing the start/stop button. On Barataza Virtuoso, the timer switch is on the side of the housing. Each of the 6 segments around the timer dial represents 10 seconds for a total of 60 seconds. The grinder switches off automatically once the selected time has elapsed. If you want to stop the grinder before the time has elapsed, simply turn the dial counterclockwise until the grinder switches off. On Bodum Bistro the timer that can be set in 5 sec intervals up to 20 seconds. Once the timer is set, to activate you have to press the start/stop button which is next to it (indicated as I/O in the picture). If you want to interrupt the grinding before the time has elapsed, simply press again the start/stop button. Breville Smart Grinder Pro does not have botton explicitely identified as Timer, but the GRIND AMOUNT/PROGRAM dial has a buit-in timer. By rotating the GRIND AMOUNT dial, you can adjust the grinding time to achieve the correct amount of ground coffee to be produced. Increasing time will increase the dose and decreasing the time will decrease the dose. Each adjustment will increase or decrease the grind time by 0.2 of a second. This feature is found only on Breville Smart Grinder Pro. Once you make your selections for the grind type and amount, all you have to do is press the START/PAUSE/CANCEL button. It will start grinding and will stop automatically when the required amount of grinds is produced. This feature is only available on Breville Smart Grinder Pro. By pressing the AMOUNT button, you can select the number of cups or shots of coffee you need. If your grind setting is in the PRESS or PERCOLATOR/FILTER range, then "cups" are selected. If your grind setting is in the ESPRESSO range, then "shots" are selected. Automatic Adjustment of Dosage: Once you choose a grind size on the grind scale, the machine will automatically adjust the dose based on the selected grind size and grind amount. In other words, the amount of coffee beans dispensed will depend not just on the amount of cups (or shots) selected, but also on the selected grind size. Manual Adjustment of Dosage: In addition, after the machine has automatically adjusted the dose, you can still adjust it further to make the coffee stronger by using the GRIND AMOUNT button. All three grinders are equipped with a container where the grinds are collected. Only the Bodum Bistro container is made of glass. The others are made of plastic. The portafilter is the part of the espresso machine that houses the basket which contains the coffee grinds. It locks into the group head on the espresso machine to pull shots (see image). Withe three grinders described here, you don't necessarily need a portafilter cradle to use a portafilter. You could simply hold with one hand the portafilter against the grind outlet while the machine is grinding. But this sometimes can get messy. Portafilter cradles/holders eliminate any messiness problems and frees your hand. Choose the portafilter cradle size that fits your portafilter. Align the portafilter cradle with the grind outlet and slide it into position. Insert the portafilter into the cradle. Use the manual or automatic grinding function to start the grinding using either the START/STOP button or the portafilter activation switch which is below the front panel. Baratza Virtuoso does not come with a portafilter cradle/holder, but it can be purchased separately (see Amazon products section below for Baratza Portaholder). Bodum Bistro does not have adapted portafilter cradles. You could grind directly into the portafilter, by holding it under the grind outlet. But, as mentioned, this could get messy, if you are not careful. All prices shown are approximate and can change any time. They include the Amazon discount on the List Price. For exact price information, please refer to the Amazon products section below. So which burr coffee grinder should you get? Breville Smart Grinder Pro takes away any guessing when it comes to the exact quantity of coffee to be ground for your "perfect" coffee. As its name says, it is a "smart" machine and calculates based on the grind type and number of cups (or shots) selected the exact amount of coffee to be ground, and it stops automatically the grinder when that amount has been produced. With Baratza Virtuoso or Bodum Bistro, you'd have to estimate the amount of time to set on the timer for the amount of grinds you want to produce. And if you don't want to rely on the timer, you'd have to guess when to depress the pulse button (for Baratza) or press the stop button (for Bodum) to interrupt the grinding process. Breville Smart Grinder Pro has stainless steel housing. This may not be critical as the plastic the Baratza and Bodum grinders are made of is high quality durable hard plastic. But for those who have all stainless steel appliances in their kitchen this point might become a consideration. Breville Smart Grinder Pro has a back-lit LCD screen which clearly shows all your various selections that the machine will process and use to compute the exact amount of grinds to be generated. Breville Smart Grinder Pro comes with two portafilter cradles/holders that eliminate any mess that can be associated by grinding directly into the portafilter. Because of all these reasons our first choice is Breville Smart Grinder Pro. Note however that even though with a Baratza Virtuoso or Bodum Bistro you will need to estimate yourself the amount of time to grind the beans, after a number of uses, you will develop a good sense for how the machine works and you will know how much time to run the machine for your particular grind selection and amount of grinds you require. You will find below all three electric burr coffee grinders compared above. Please click the burr coffee grinder of your choice below for price information or to purchase.